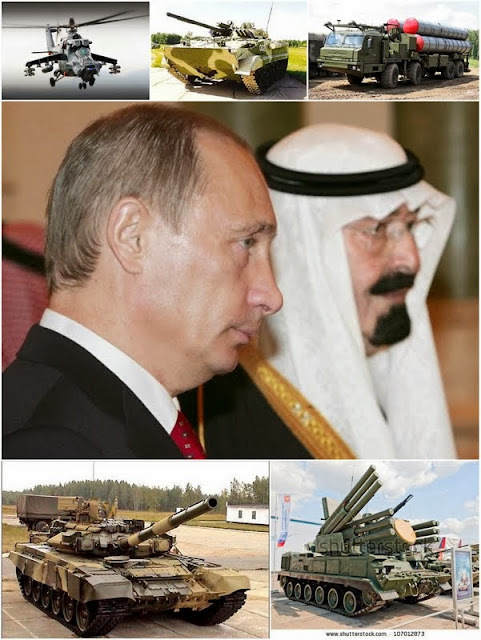 Russian President Vladimir Putin’s phone call to Saudi King Abdullah on Sunday (after the crackup in U.S.-Saudi relations) has revived talk of the oil-rich kingdom offering to buy billions of dollars worth of arms from Moscow. That’s the view of diplomatic sources quoted by Political Consultant/Analyst Nasr al-Majali, writing today for Elaph news portal. Saudi businessman, journalist and author Othman al-Omeir, a former editor-in-chief of the Saudi newspaper of records Asharq Alawsat owns Elaph. A statement by the Kremlin said the Russian President and Saudi monarch on Sunday discussed international issues over the phone. During the conversation requested by the Russian side, the two leaders focused on the Syrian conflict and Iran’s nuclear ambitions, the statement said without elaborating. Western countries suspect Iran of using its nuclear program to develop atomic weapons, a claim Iran has consistently denied. Tehran claims it needs atomic technology for producing electricity, although it has some of the world’s largest reserves of oil and gas. Pantsir-S1, a short to medium range ground based air defense system, wheeled, tracked or stationary. According to Simon Henderson, director of the Gulf and Energy Policy Program at The Washington Institute, if Riyadh concludes a major arms deal with Moscow in return for reduced Russian backing of Syria’s Assad regime, it will come at the expense of U.S. influence in the Middle East and possibly across the world. From the moment it was announced, the July 31 Moscow meeting between Russian President Vladimir Putin and Saudi intelligence chief Prince Bandar bin Sultan was clearly of political significance. The "long and serious" discussions between the two reportedly lasted four hours and left the Saudis "in a positive mood." According to an August 7 Reuters report, Riyadh offered to buy $15 billion worth of weapons from Moscow and avoid threatening Russia's position as the main natural gas supplier to Europe, in return for Russia easing its strong support for the Assad regime and agreeing not to block any future UN Security Council resolution on Syria. According to unidentified diplomats quoted in the story, the Russian response has so far been inconclusive, though Moscow reportedly pressured Damascus to allow [the] visit by a UN mission investigating suspected chemical weapons use.